In the early 1730s in England there were “Scotch Masons” or “Scots Master Masons,” which was a step after the Master Mason Degree (and apparently unrelated to Scotland). In 1743 the Grand Lodge of France adopted a regulation limiting the privileges of “Scots Masters” in lodges. It’s clear from these few mentions that something was going on behind the scenes with “Scottish Masonry,” but we’re not quite sure what. These developments were happening at the same time the Royal Arch was gestating before its birth in 1754. It’s even possible that the Royal Arch and Scottish Masonry came from the same sources. We just don’t know …. until now. 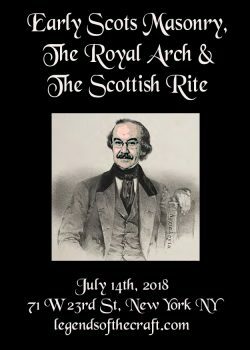 “Early Scots Masonry, The Royal Arch and the Scottish Rite.” explores the early migration of Scots Master from Britain to Europe, its association with Royal Arch Masonry, and how it became the foundation for the Scottish Rite Degrees.